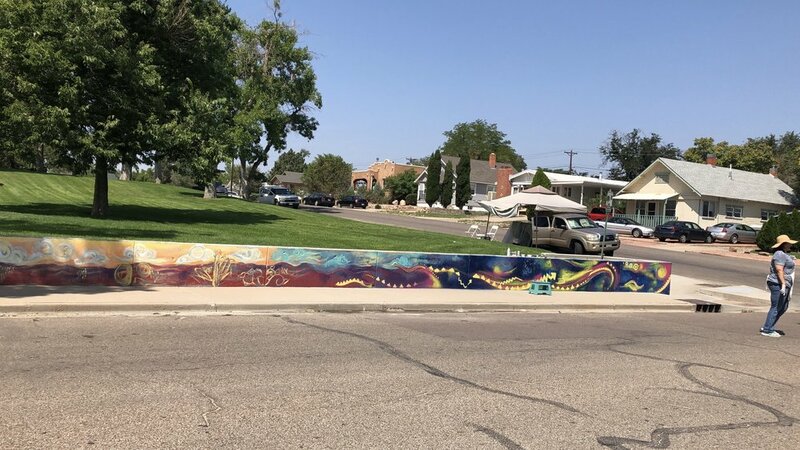 Maria Lopez and I have been collaborating to create a mural on a retaining wall in Mitchel Park, east side Pueblo. I went down to Pueblo on Aug 20 and Maria and I work Aug 21- Aug 25. Southern Colorado Paint Recycling provided us with a 25 gal paint donation once they heard we were doing a community mural commissioned by Eva Montoya. Eva is an elder of Pueblo. She taught many children over her 20 years as a grade school teacher. She sat on city council and has done countless volunteer hours of service towards the growth and betterment of Pueblo. My auntie Avalina lives six blocks from the park, and when I asked her if she knows Eva she replied “everyone knows Eva,” just like anyone else you might ask in Pueblo. The while the rest of my family live in Rocky Ford and my Auntie Sally and Uncle Sam came to visit day three of painting the mural. They treated me to a delicious meal at Red Lobster, I am still so grateful for! 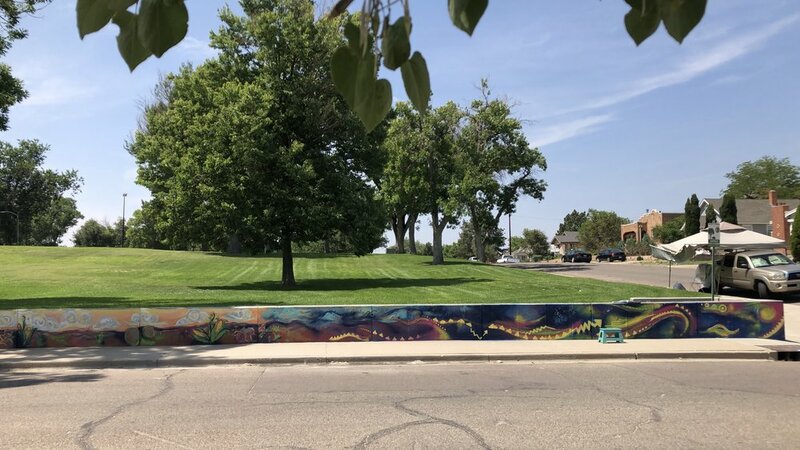 The mural called: “Our East Side Story of Community Unity,” was inspired by the retaining wall at Mitchel Park often tagged by youth finding refuge with different gangs locally and nationally. The park is in the “rough side of town” according to the locals. East Side Pueblo is rich with the native population and heritage however. The neighborhood would all visit us as we were working, most everyone friendly and grateful for us “to take the time to care” and do something that would clean up the neighborhood. I struggled with this though. If people wanted to express themselves and create art, how was that different from what Maria and I were doing? I asked Sancho, the owner of the barber shop where I used the restroom. He explained the “taggers make the neighborhood look dirty,” and the mural that Maria and I were doing, “was art, and set a positive example.” I felt better after consulting Sancho, his shop is on 8th and Monunment, the park is on 12th and Monument. 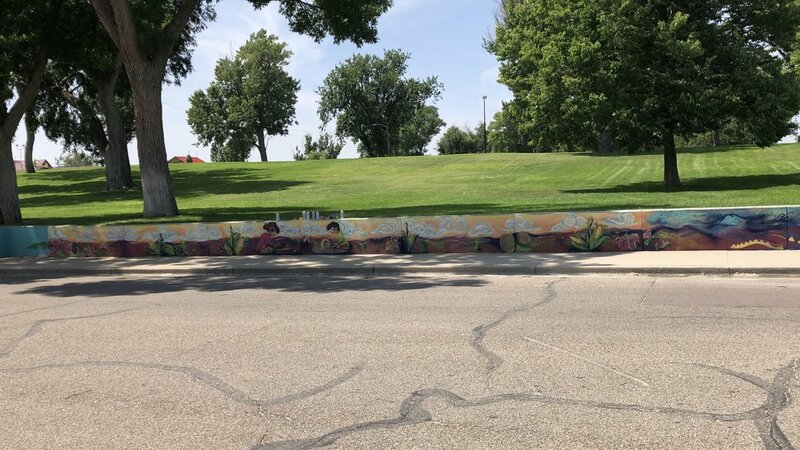 Maria and I are volunteering our time in hopes we can make a difference in the community and we have our partners Eva Montoya, Pueblo Parks and Recreation, Southern Paint Supply, and the East Side community to help us!